Clayton Foltyn with Hannah Sixkiller and Delaney Wadsworth. 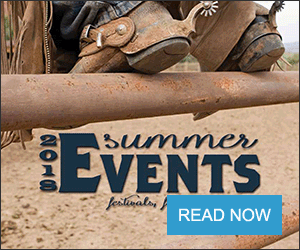 When the Budweiser Event Center in Loveland, Colo., donated a suite to Western Wishes for the August 10 performance of the PRCA rodeo they had no idea it was going to be turned into a meet and greet with some of the top cowboys and cowgirls in the PRCA. At this performance Western Wishes was blessed to have Milton Dailey from Ranch and Resort TV there to film the evening with all the amazing cowboys and cowgirls with kids. This evening at the rodeo for these kids would not be possible without the support from Wrangler, Fresh Rides Inc., and the Budweiser Event Center, these three sponsors along with the Larimer County rodeo committee made it possible to bring 18 people into the Western Wishes suite where we had dinner, autographs and smiles all night. Gold buckle after Gold buckle walked through the door and made the evening memorable for Hannah Sixkiller, 7, who is currently in a courageous battle over stage III cancer (brain tumor), Delaney Wadsworth, 3, who was diagnosed with diffuse pontine glioma and last but, not least Sierra Brewster’s family, Sierra was born in September of 2009. She was three months premature, and weighed 1 pound and 4 ounces. Sierra currently is continuing her precarious battle for life at Children’s Hospital in Denver, Colo., with no release date set. But we were proudly joined by her big brother and dad. These three families got to meet and have dinner with; Joe Beaver, Courtney Ford, Sami Jo Sweeney, Will Lowe, Wes Stevenson, Ken Lewis, Wade Sumpter, Clayton Foltyn, Heith Demoss, John and Carla Harrison, Andy Burelle, and Hadley Barrett. All of these cowboys were great people – they signed autographs and exchanged e-mails with the kids to keep up with each other’s battles. A lot of these cowboys are still in their battle to secure a gold buckle at the upcoming National Finals in Las Vegas and could relate very closely with the kids because they are all fierce competitors. Many of these cowboys and cowgirls have been involved with Western Wishes before and were super excited to have the opportunity to meet these truly special kids with amazing fighting spirit. Clayton Foltyn, Heath Demoss, Courtney Ford and Sami Jo Sweeney were troopers – they waited until all the families arrived and made sure everybody had autographs and special gifts from them. There were numerous amazing stories throughout this night but probably the most heartfelt story from this night would be the one of young Hannah and her mom, Ryan, who are both avid horse people. 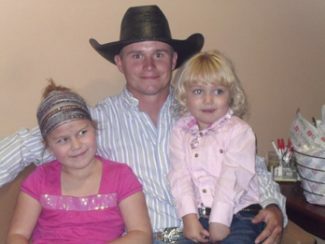 Ryan team ropes and comes from an awesome cowboy family. We never promise families anything, but a great time at the rodeo due to the hectic schedule cowboys have and travel time from rodeo to rodeo so we knew Joe Beaver was going to try his hardest to make it from Yuma, Colo., to Loveland, Colo., to meet our families but we didn’t know how much time he would have. So when Joe came to do his interview with Ranch and Resort TV, I returned to the suite to let Hannah and Ryan know that he made it. Hannah being a roping enthusiast was very excited and her Mom being a team roper was maybe even a bit more excited than her daughter. As I let Joe know about the Sixkiller’s you could tell he was very anxious to meet this family. Joe and Hannah formed a very special bond as they sat on the couch in the suite and talked nothing special just two very fierce competitors talking about life, horses etc. Will Lowe and Wes Stevenson also made time to join us after they had rode, due to traffic they made it late but still made the time to get there. I had the honor to speak with Will who is also a dad himself. He was signing autographs and as Delaney sat on his lap she melted into his arms, her big blue eyes and precious blond curls. He held her there for a couple minutes and talked before having to head down the road to Missouri to another rodeo. It is guys like this that really show you there are still so many great cowboys for our kids to look up to – they had a long drive all night but still took time to put a smile on these kids faces. Traveling partners Wade Sumpter and Ken Lewis even stopped by after having no luck in there bull dogging runs they came up to the suite and watched most of the rest of the rodeo with all three of the families. This is the mark of true champions they had no luck and still showed up with smiles and were anxious to do anything they could to help. This is why Western Wishes is such a great program for rodeo families. Cowboys are a small family that are always willing to lend a helping hand to another cowboy. We all compete in the arena but the greatest battles we will ever see fought are not in the arena’s they are the battles these young kids have daily in life, the battle for their lives. I believe this is why these amazing cowboys and cowgirls show up to support Western Wishes. It isn’t about Gold Buckles it’s about what you give back in your pursuit of that gold buckle that makes a true champ, so no matter what happens this year in Vegas in there pursuit for a Gold buckle’s these cowboys and cowgirls are all Champs.